Eye surgery is extremely rewarding when done properly. Years of training, the correct instruments and high quality magnification are key elements required to achieve this. At Melbourne EyeVet, eye procedures are performed only by specialists. During your consultation all surgical options will be discussed with you so that you are fully informed to make the best decision for you and your pet. If your pet is coming in for surgery, please make sure they are fasted. This means they can have their normal dinner the night before surgery, but no food should be given after midnight. It is fine to leave a water bowl down overnight. ​Puppies should be given a small meal of wet food at around 6am before coming in for surgery. 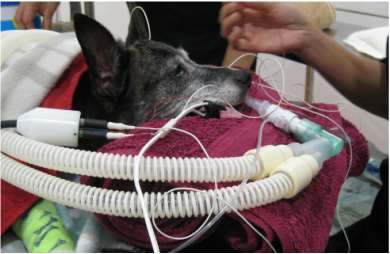 We take it very seriously when an animal is having an anaesthetic, we want the best care for your pets. We are constantly making sure we are using the most up to date drugs and protocols for the safety of our patients. 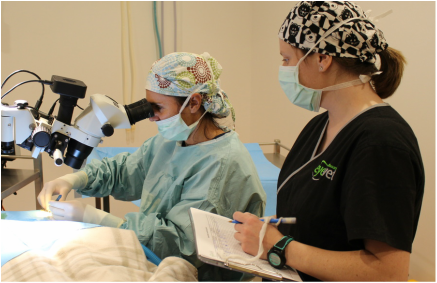 Eye surgery is a specialised field and is therefore more expensive than a local vet, as is the equipment needed to perform these procedures. Animals can't control their body temperature under anaesthetic so we use a Mistral patient warmer to keep our patients warm. These are like a sleeping bag filled with warm air which allow us to warm a patient without the risk of burns.